This lovely piece came from another blog reader, and blogger herself. I like her use of glitter with the rubber stamps. 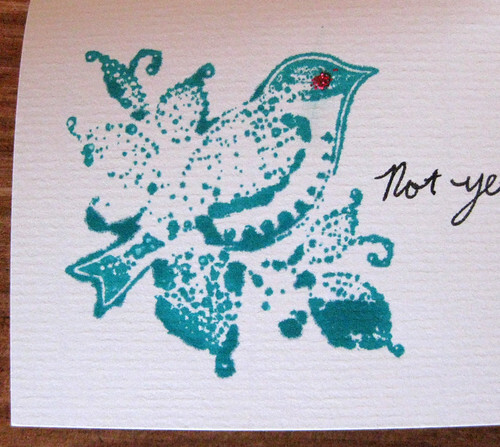 By this bird stamp, at the end of the letter, she wrote "not yet a master at stamping" -- HA! Neither am I! I just don't post photos all my flubbed attempts here. But I think this bird, with its glitter eye, is charming. Lovely paper and envelope, too. Yay! 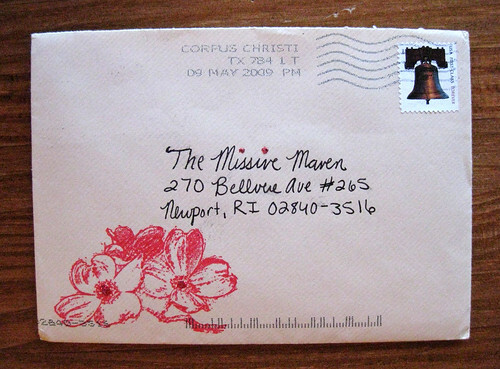 My letter :) Glad to know I'm not the only one with Stamp Issues ^_^ I'll be writing back to your letter soon! Take your time - write when the time is right. Ah yes, your letter, Aunt Amelia, is awaiting a response from me. I'll include more details there on my own glitter info, but the short skinny is that I use Stickles glitter glue and Glimmer Mist glitter spray. Both I buy from eBay but they should be available from many craft stores, both online and physical stores. 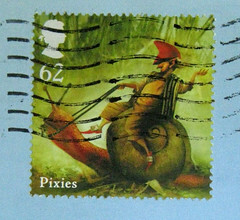 I love that stamp, any ideas where I could purchase a similar one please? Anonymous - only in the rarest of circumstances am I aware of purchase information on items I receive, and this is no exception.